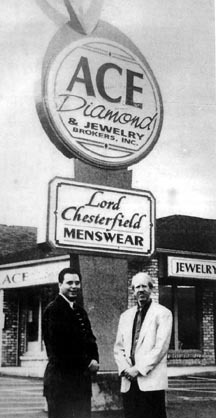 Although Ace Diamond & Jewelry Brokers officially opened for business in April of 1987, the story really begins many years before, with my maternal grandfather, Dominic Sandine. The son of Italian immigrants, he was born in Youngstown at the end of World War I. A keen competitor, he would become an accomplished pool shooter, a semi-professional pinochle player, a nationally ranked table tennis champion and later, an outstanding small businessman. Among his many other interests, Dom Sandine became intrigued with jewelry. As a young man he took formal diamond setting courses and traveled door-to-door buying timepieces and precious metals. In 1949 he became a licensed pawnbroker and opened his first shop in downtown Youngstown. Early on, my grandfather handled jewelry, firearms, musical instruments, luggage and apparel. Eventually his store evolved into a plush, jewelry-only boutique on Phelps Street, and his loan and retail clienteles stretched from New York City to Las Vegas to south Florida. Along the way, Dom Sandine had five daughters, and he employed several sons-in-law at his store. One of them was my father, Jim Eckman. My father was also born and raised in Youngstown. He graduated from East High, briefly attended Youngstown University and took a home-study diamond course. He had been a fireman and later would be a construction worker, but the work that my father did at my grandfather’s shop in the 1960s would have the greatest vocational impact on him. My father opened his own store, Ace Pawnbrokers, in downtown Youngstown in the early 1970s. Ace Pawnbrokers bought-out several other pawnshops, and by the mid-1980s had become Ace Diamond & Gold Brokers, a jewelry-only store. In their final forms, my grandfather’s and my father’s businesses were estate jewelry stores. Estate jewelry is any jewelry that is pre-owned, and it can be from an earlier period or contemporary. Jewelers with pawnbroking licenses are well-positioned to acquire highly desirable estate jewelry. On the retail side, estate jewelers cater to those seeking large diamonds and unusual pieces. My brother Dominic and I worked at our father’s and our grandfather’s shops on weekends and during school breaks throughout the 1970s and 1980s. In 1990, Dom Sandine officially retired. He remains remarkably active, visiting local jewelers and pawnbrokers, attending auctions and traveling. Jim Eckman Sr. died in 1986, and his closely-held corporation, Ace Diamond & Gold Brokers, was dissolved shortly thereafter. Ace Diamond & Jewelry Brokers, Inc. opened on Market Street in Boardman, in April of 1987, with assets from Ace Diamond & Gold Brokers. We moved to our current 7110 Market Street location 10 years ago, in April of 1997. My grandfather and father always had downtown Youngstown locations, so opening a store in Boardman after my father’s death was a sharp break from tradition. Boardman offered free parking, increased traffic, more convenience and no city income tax. 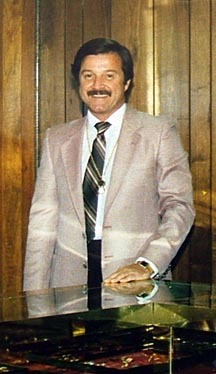 Moving to Boardman, however, was one of the very few ways in which Ace Diamond & Jewelry Brokers would deviate from the doctrines of Dom Sandine and Jim Eckman, Sr.
Dom Sandine taught Ace to concentrate on pawnbroking, and that the other aspects of the business, like retailing, would fall into place. He would say that a pawnbroker’s inventory is the cash in his safe (a reference to the fact that a jeweler can buy better over his counter than he can anywhere else in the world), and he had learned how to manage money so well that his business could easily handle the largest deals. Dom Sandine’s game plan was very different from that of pure-play retail jewelers whose primary focus would be merchandising. Much could be written of Dom Sandine’s small business acumen, and many of his ideas are as relevant today as they were 20 years ago. Ace Diamond & Jewelry Brokers has written millions of dollars in loans and over-the-counter purchases and yet, as a result of following Dom Sandine’s advice, Ace has no term debt and has been rated #1 by the Jeweler’s Board of Trade for 18 straight years. Of course, without my father, there would be no Ace Diamond & Jewelry Brokers. 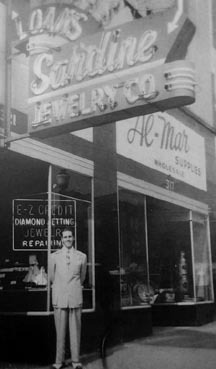 Whereas my grandfather and father started from scratch, Ace Diamond & Jewelry Brokers began with a loan portfolio, inventory, equipment, a trained staff and a client base – all inherited from Jim Eckman, Sr.
My father made extraordinary contributions to the Ace culture, too. Ever supportive and very easy to work for, he gave us a free hand and all of the capital we needed to deal one-on-one with our clients. Employees so empowered get a great deal of satisfaction from their work, and the clients of empowered employees enjoy the best in personalized and unrestrained service. On a personal note, there was always a job for me at my father’s stores. I worked for my father on and off since I was 13 or 14, and at the time of his death, I was 26 years old and was 18 months into my latest stretch of employment with him. It is obvious from the discussion above that Ace Diamond & Jewelry Brokers was not a true start-up when it appeared in Boardman 20 years ago. It was, in fact, the latest incarnation of the estate jewelry business begun by my father, the star student of my maternal grandfather. As for my grandfather, he started out with nothing and accomplished all that he did with little or no help from anyone. Because of the earlier efforts of these two men, Ace Diamond & Jewelry Brokers began with the types of advantages that most start-up businesses could only dream of. Thank you Jim Eckman, Sr. and Dominic Sandine for introducing us to this special profession and for providing us with what we would need to succeed for 20 years - and beyond. 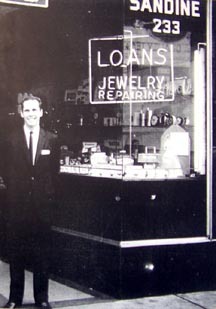 Ace Diamond & Jewelry Brokers, Inc.
1949: Dom Sandine becomes a licensed pawnbroker and opens his first shop on E. Federal Street in downtown Youngstown, Ohio. 1950s: Sandine's is now located at 233 E. Federal. He would retire from a highly successful Phelps St. location in 1990. 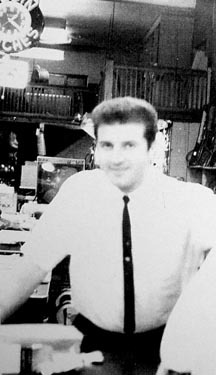 Early 1960s: Jim Eckman, Sr. at Sandine's. He was a quick study and had a strong interest in the pawnbroking business. 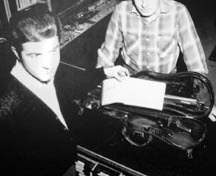 Circa 1962: Son-in-law Jim Eckman writes a loan on a violin at Sandine's. Later, both men would focus on jewelry only. 1985: Jim Eckman, Sr. at Ace Diamond & Gold Brokers on Federal Plaza West. He first opened his own store in the early 1970s. 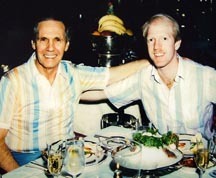 Early 1990s: Dom Sandine takes grandson Jim Eckman to dinner at Caesar's Palace after a jewelry trade show in Las Vegas. 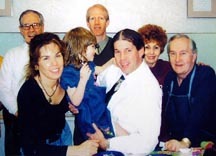 2004: Dom Sandine, Leslie, Ashlie, Jim & Dom Eckman, Mary Ann & Jim Huesken at Ace Diamond & Jewelry. 1997: Banker Greg Jumper (left) with Jim Eckman, Jr. at Ace Diamond & Jewelry Brokers' new 7110 Market St. building in Boardman. (Photo courtesy of John Darnell, The Boardman News). Archival photos courtesy of Mary Ann Huesken.